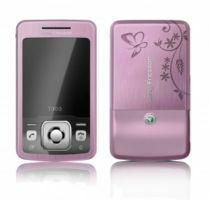 The world’s leader in mobile communication, Sony Ericsson recently has announced a special Butterfly edition T303 handset for the upcoming Valentine’s Day. T303 Butterfly offers a pink chrome casing with butterfly and flower design on the rear, a reflective mirror glass display as well as a matching charm and carrier pouch. The specification of T303 Butterfly is same as the original T303 with 14.7 mm thickness, weight 93 grams, 1.8 inch TFT screen with 56K colors and battery life up to 9 hours talk-time as well as 400 hours of standby time. Beside that, it also built in with other features includes GPRS, Bluetooth 2.0 USB, Java MIDP 2.0, 1.3 mega pixel camera, MP3 player, FM radio with RDS, TrackID along with games plus downloadable games, calculator, calendar, stopwatch, tasks, voice memo, SMS, T9, MMS and built in hands-free. The T303 Butterfly is design exclusively for Orange shop users and will be available at Orange shop starting at the end of January for the price of $39.99.